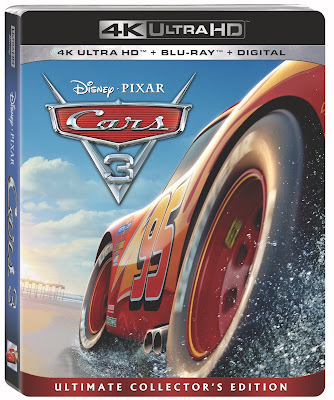 Lightning Strikes Again When Disney•Pixar’s “Cars 3” Cruises Home Digitally in HD and 4K Ultra HD™ on Oct. 24 and Blu-ray 4K Ultra HD™ & Blu-ray™ on Nov. 7. In honor of world-champion racer #95 on his date-sake 9/5, Disney•Pixar is proud to announce the in-home arrival of Disney•Pixar’s “Cars 3”! “Cars 3” surged to the front of the pack opening weekend with audiences racing to see the legendary Lightning McQueen (voice of Owen Wilson) and spirited trainer Cruz Ramirez (voice of Cristela Alonzo) team up to beat the new generation of blazing-fast racers. Now, this summer’s high-octane hit cruises home—loaded with bonus features like the all new mini-movie starring the demolition derby legend Miss Fritter— Digitally in HD and 4K Ultra HD™ on Oct. 24, and on Blu-ray 4K Ultra HD™ and Blu-ray™ on Nov. 7. • Theatrical Short: “Lou” – When a toy-stealing bully ruins recess for a playground full of kids, only one thing stands in his way: the “Lost and Found” box. • Let’s. Get. Crazy. – Get schooled in the world of demolition derby, the “rules” of figure 8 racing, and how Pixar puts the crazy in the Thunder Hollow Crazy 8 race. This piece is hosted by Lea DeLaria. • Legendary – a close, historical look at the racing legends Wendell Scott and Louise Smith, whose tenacity and perseverance got them into the race even when they weren’t invited. • Ready for the Race – Disney Channel’s Olivia Rodrigo and NASCAR Racer William Byron check out the Hendrick Motorsports campus to showcase how real-world race training influenced the filmmakers. • World’s Fastest Billboard – Blink and you will miss all of the graphics and “car-ified” advertisements created by Pixar’s Art team to make the ”Cars 3” world as believable as possible. • Cruz Ramirez: The Yellow Car That Could – Join Cristela Alonzo and the filmmakers on their journey to create a race-car trainer turned champion racer. • Generations: The Story of “Cars 3” – For the story team, creating Lightning McQueen’s next chapter didn’t involve just a tune-up, but a complete overhaul. • Cars To Die(cast) For – Take a look at the phenomenon of die-cast toy collecting and the more than 1,000 unique designs that exist in the Cars universe. • 5 – As “Cars 3” gets underway, world-champion racer Lightning McQueen is riding high with five Piston-Cup wins under his hood. • 11 – Lightning McQueen raced into moviegoers’ hearts 11 years ago—making his rookie debut in “Cars” in March 2006—and remains an iconic character today. • 24 – The dramatic, slow-motion crash scene in which Lightning McQueen hits a wall and rolls several times takes 24 seconds. • 95 – Lightning McQueen still sports the dynamic #95 with his signature lightning-bolt graphics. He displays five distinct looks in “Cars 3,” including one that pays homage to his original paint, a primer look he gets following the devastating crash, a custom wrap ordered by Sterling, and more. • 198 – Lightning McQueen tops out at a speed of 198 miles per hour on his last lap with Cruz Ramirez on Fireball Beach. But Lightning’s nemesis—next-gen racer Jackson Storm—races at speeds pushing 207 mph.